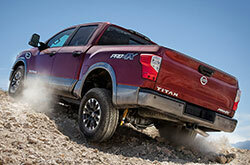 The Titan XD carries over largely unchanged after debuting last year. It's now joined by the standard-wheelbase Titan, which returns from a yearlong hiatus with a full redesign that brings its styling in line with the XD. With a full design update, Titan looks more aggressive than ever. Plus, it's now outfitted with a new Endurance V8 engine that offers huge increases in horsepower compared to the eight-cylinder on the 2015 Titan. Continue our 2017 Nissan Titan review below to learn more. When shopping for the 2017 Nissan Titan in Albuquerque you'll have a choice of S, SV, SL, PRO-4X and Platinum Reserve trim levels. Two cab styles are available, Crew and Single, and both are offered with either 4X2 or 4X4 setups. 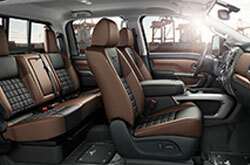 A few main differences that separate the Titan XD from the Titan include its unique chassis and longer wheelbase; additionally, its Crew Cab model offers a significantly longer bed. Standard features across the board are very impressive. Entry-level models don't disappoint with Bluetooth Hands-Free Phone, USB/auxiliary ports and a hands-free text messaging assistant. 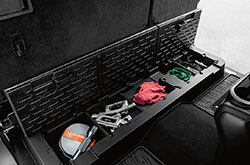 In addition, the base model is built with Easy Clean vinyl floors and an optional spray-on bedliner. The Titan and Titan XD come standard with a heavy-hitting 5.6-liter Endurance V8 engine that produces 390 horsepower. Torque output is 394 lb-ft on the Titan and 401 lb-ft on the XD. The engine is mated to a seven-speed automatic transmission on both models. 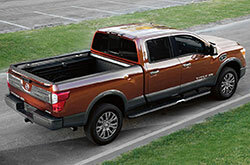 If a diesel is more your speed, the Titan XD also offers an available Cummins Turbo Diesel V8, which produces 310 hp and a whopping 555 lb-ft of torque that allows for excellent towing capacity according to many 2017 Nissan Titan reviews. A wide range of safety features are included on the 2017 Nissan Titan in Albuquerque, starting with standards like Vehicle Dynamic Control with Traction Control, the Nissan Advanced Airbag System, LATCH and Zone Body construction with crumple zones. Additionally, select Titan trim levels offer intelligent systems like rear cross traffic alert, blind spot monitoring, and NissanConnect services with automatic crash notification. 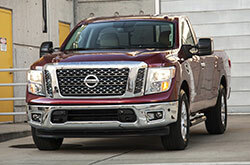 The Nissan Titan Is on Sale! If you've been shopping for new vehicles near Albuquerque like the 2017 Chevy Silverado, Ford F-150 and the Dodge Ram 1500, then you should definitely take a look at the 2017 Nissan Titan. The car's luxury on-board technologies and eye-catching exterior design could wind up being just what you need from a daily driver. Take advantage of the facts and figures from our report too determine if the 2017 Nissan Titan is ideal for your commuting needs. Also make sure you take a gander at Nissan finance and lease offers on our site! For new and quality used cars, choose us to find a superb selection, which includes the critically acclaimed Nissan Titan. Note the specs that you found pertinent after reading our 2017 Nissan Titan review; those are the particulars that will safeguard you from making a purchase you think down on later. Stop by our car center in Albuquerque, NM, and explore the brand-new Nissan Titan up close. Also, prior to your visit, you can see its classy exterior design from all vantage points by watching our video clip.